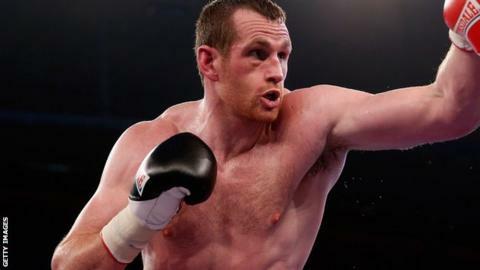 Heavyweight boxer David Price wants an all-British fight against Tyson Fury or Dereck Chisora next summer. Fury will meet Chisora on 29 November at London's ExCeL Arena. And Price, 31, believes he could fight the winner, even though the bout is billed as a final eliminator for the WBO title and a chance to face world champion Wladimir Klitschko. "It's definitely a fight that I want," said Price. "I'm hoping for a big domestic fight against Tyson Fury." The 6ft 8in Liverpool fighter is set to make his comeback next month after recovering from hand surgery. "I'll be fighting again in December," he told BBC Sport. Price is set to fight on 6 or 13 December in either Germany or Denmark, saying he will return to England in February in "a meaningful step-up". The former British and Commonwealth champion is rebuilding his career in Germany with promoters Kalle and Nisse Sauerland after being beaten twice by American Tony Thompson in 2013. However, Price says he has put that behind him and believes he is close to another big fight next year. He said: "The Tony Thompson saga seems like another lifetime to me now and I'm in a great place. After spending 12 months out in the cold of the heavyweight division, people know I'm on the verge of being in big fights again." He added: "The fight between me and Tyson Fury is the biggest domestic heavyweight fight out there and hopefully we can get something done next year." Fury and Price have a history of exchanging insults, both in interviews and on social media. In 2012, Price called Fury "idiotic" after being on the receiving end of an expletive-filled Twitter rant by the Manchester fighter. "I think it's just because he's bored. He makes a bit of a noise on Twitter to get people talking about him again. "He hasn't fought for a while and I think the last time he was in the ring was 10 months ago. His way of keeping himself in the limelight is to be outrageous on Twitter and make silly comments." Fury was then fined £3,000 by the British Boxing Board of Control in March 2013 for tweets he posted about Price and light-heavyweight fighter Tony Bellew. The two fighters were involved in another Twitter row on 21 October, in which Price wrote that if a bout between them was arranged, "I'll be there to iron you out". Even though the winner of the fight between Fury and Chisora expects to then face Klitschko, Price believes they would have a long wait to do so - and might have to take another fight in between. He said: "The fact is, whoever wins that fight is going to have to wait a while for a shot at Klitschko. But would they take a chance of fighting someone like me in between? We'll soon find out." Price is also open to a fight next year against London 2012 Olympic gold medallist Anthony Joshua, who is promoted by Eddie Hearn through Matchroom Sport. He said: "If Eddie Hearn and Matchroom want to stick to their guns by saying they want me to fight Anthony Joshua, then that's a very interesting fight as well. "But in a nutshell, I think I'm a couple of fights away from a big domestic one. That's where I'll come back and prove every doubter wrong."